The correlation of higher HDL levels with reduced risk of cardiovascular disease is firmly established—and so multiple therapeutic strategies have explored raising HDL. But correlation is not causation, and the appealing simplicity of this hypothesis is now encountering some challenges: the failure of two clinical trials of drugs, which raised HDL but did not reduce cardiovascular events; and the failure of genetic studies to show a causative relationship between lower HDL levels and cardiovascular disease . Nonetheless, alternative strategies to raise HDL continue to be pursued. 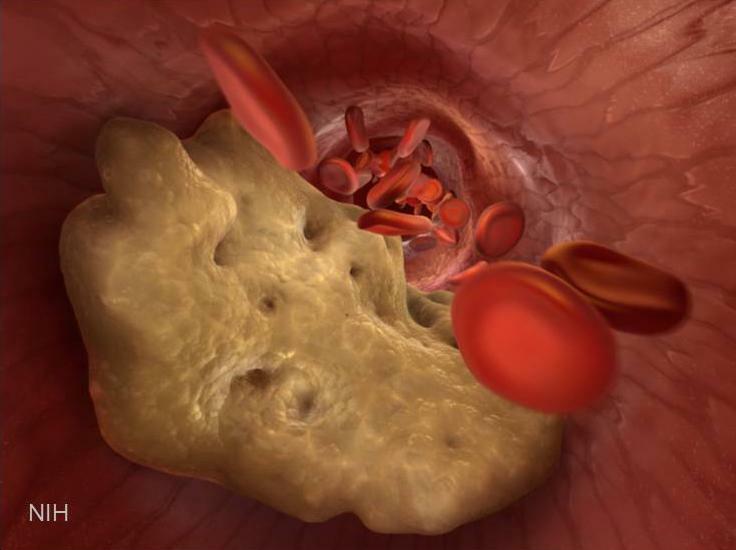 NIH-funded researchers, based at Massachusetts General Hospital and Harvard Medical School in Boston, have figured out a new approach to boost HDL. They are targeting microRNA (miRNA), which are short pieces of ribonucleic acid (RNA) that regulate protein production by disabling longer RNA templates, called messenger RNA . 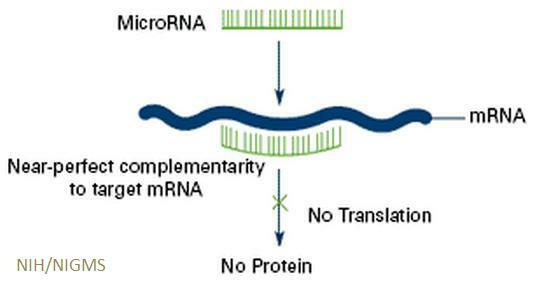 Caption: MicroRNAs stick to mRNA molecules and prevent the mRNAs from being made into proteins. Their strategy for raising HDL involves targeting a family of miRNAs—miR-33a and miR-33b—that plays a key role in regulating the complex network of genes that control cholesterol levels. A couple of years ago, the researchers discovered that one function of miR-33a and miR-33b is to inhibit production of a protein, called ABCA1, involved in cholesterol transport and HDL production . They hypothesized that if they could somehow silence these miRNA silencers, they might be able to increase HDL production. First, they blocked miR-33a in mice, and the animals’ HDL rose . But, unlike mice, humans and other primates have two miRNAs that regulate ABCA1: miR-33a and miR-33b. So, the team designed an anti-miRNA molecule that recognized a shared sequence in miR-33a and miR-33b and stuck to these molecules in a way that blocked their function (think of this as RNA Velcro). They then injected the anti-miRNA therapy into obese African green monkeys once a week for about four months. These anti-miRNA’s spread throughout the primates’ bodies and stuck to miR-33a and miR-33b, allowing greater production of the ABCA1 transporter protein and boosting HDL levels as much as 40% compared to control animals. The therapy appeared to have no major side effects, and researchers are now conducting safety studies in preparation for possible human clinical trials. This marks the first time that a single anti-miRNA molecule designed to target a family of miRNAs has been used to induce a therapeutic effect in non-human primates. It lays the groundwork for developing additional therapies that target other miRNA families implicated in human disease. The miRNA field, discovered just a little more than a decade ago, has been exploding with insights over the last few years. My own lab has done related work to identify which miRNAs control cellular and plasma levels of lipids—fatty molecules that include, but are not limited to, cholesterol. People with abnormal blood lipids are at a greater risk of developing diabetes, stroke, and heart disease. That’s why finding the molecular regulators is so vital. We examined 150 miRNAs in the liver of a mouse and, using computer simulations, identified some of the pivotal players . We discovered that another miRNA, miR-27b, appears to modulate the production of important lipid metabolism proteins (PPARG, GPAM, and ANGPTL3). We still need to do more studies to verify whether miR-27b is a good target for controlling lipid levels in humans. But one thing is clear: miRNAs are powerful regulatory molecules and may open the door to new treatments for cardiovascular disease, as well as many other conditions. HDL—is it too big to fail? Ng DS, Wong NC, Hegele RA. Nat Rev Endocrinol. 2013 May;9(5):308-12. Pharmacological Inhibition of a MicroRNA Family in Nonhuman Primates by a Seed-Targeting 8-Mer AntimiR. Rottiers V, Obad S, Petri A, McGarrah R, Lindholm MW, Black JC, Sinha S, Goody RJ, Lawrence MS, Delemos AS, Hansen HF, Whittaker S, Henry S, Brookes R, Najafi-Shoushtari SH, Chung RT, Whetstine JR, Gerszten RE, Kauppinen S, Näär AM. Sci Transl Med. 2013 Nov 20;5(212):212ra162. MicroRNA-33 and the SREBP host genes cooperate to control cholesterol homeostasis. Najafi-Shoushtari SH, Kristo F, Li Y, Shioda T, Cohen DE, Gerszten RE, Näär AM. Science. 2010 Jun 18;328(5985):1566-9. MicroRNA-27b is a regulatory hub in lipid metabolism and is altered in dyslipidemia. Vickers KC, Shoucri BM, Levin MG, Wu H, Pearson DS, Osei-Hwedieh D, Collins FS, Remaley AT, Sethupathy P. Hepatology. 2013 Feb;57(2):533-42. I believe that Dr. Collins’ statement that “correlation is not causation” is the single most important lesson that I teach residents and fellows at the academic medical center where I work.